1College of Economics and Management, Northwest A&F University, Yangling 712100, Shaanxi, China; 2Institute of Water Saving Agriculture in Arid Areas of China, Northwest A&F University, Yangling 712100, Shaanxi, China; 3College of Animal Science and Technology, Northwest A&F University, Yangling 712100, Shaanxi, China. Abstract | Extreme weather conditions affect livestock production and also results in significant livestock mortality in Mongolian plateau. A field study was carried out during the years 2015 and 2016, in South Gobi and Khentii provinces, Mongolia, to determine the effect of extreme weather conditions (hypothermia and droughts) on livestock husbandry, livestock mortality and herders economic loss. Herder households were interviewed in South Gobi (n= 56) and Khentii province (n= 44). Our finding showed that extreme weather conditions and diseases significantly results in livestock mortality in South Gobi and Khentii provinces. Compared to large ruminants, goats (56.4% & 64.2%) and sheep (38.4% & 33.4%) mortality was higher in South Gobi and Khentii province during 2015 and 2016. During 2015, per herder household economic losses because of livestock mortality in South Gobi and Khentii provinces was higher (565.8 & 395 USD) as compared to 2016 (232.5 & 296.6 USD), respectively. In Khentii province, household monthly income (238 USD) from livestock husbandry was 4.5% lower than their expenditures (248.8 USD) while in South Gobi province monthly income (244.4 USD) was 5.8% higher than their monthly expenditures (230.5 USD). Dzud (extreme low temperature and heavy snowfall), diseases, pastures degradation, and poor fodder production and water availability during droughts are the crucial issues of herder livelihood in South Gobi and Khentii provinces. Therefore, it is suggested that government should support herders to improve their livelihood and reduce their economic losses because of diseases and extreme weather conditions. Citation | Bilegjargal B, Lu Q, Ahmad I, Saeed M (2017). Effect of hypothermia and droughts on livestock mortality in southern and eastern mongolia effect of hypothermia and droughts on livestock mortality in southern and eastern mongolia. J. Anim. Health. Prod. 5(4): 149-158. Copyright © 2017 Bilegjargal et al. 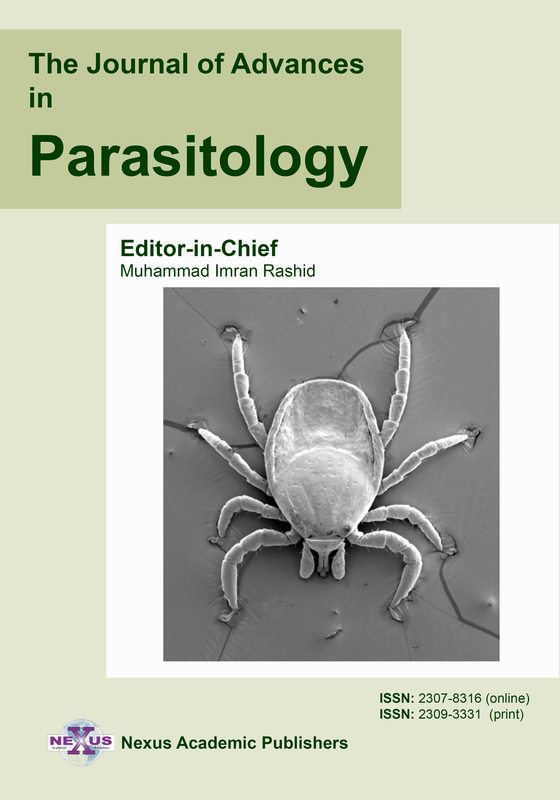 This is an open access article distributed under the Creative Commons Attribution License, which permits unrestricted use, distribution, and reproduction in any medium, provided the original work is properly cited. Livestock husbandry is an integral part of rural household economy in many developing countries (Dovie et al., 2006; Simela et al., 2006). Especially in rural areas herders income mainly depends on livestock husbandry (Mahul and Skees, 2007). Livestock sector is the back bone of Mongolian economy and 50% of Mongolian population depends on livestock husbandry (Johnson et al., 2006). Livestock sector shares to the gross national products was more than 30% (Shagdar, 2002). During 2015, 55 million livestock were reported in Mongolia which consists of 367900 camels, 3294600 horses, 3779500 cattle, 24933400 sheep and 23582200 goats (NSO, 2015). Dzud (extreme low temperature and heavy snowfall), droughts, degradation of pastures, diseases and inadequate government support to livestock sector are the main constraints of Mongolian livestock production (Shabb et al., 2013). Dzud and droughts are the major types of climatic hazards in Mongolian plateau (Marin, 2010), which is also the main causes of excessive livestock mortality in dry regions of central Asia (Middleton and Sternberg, 2013; Sternberg, 2010; Tachiiri et al., 2008). Previous study suggested that dzud is more dangerous compare to drought and livestock mortality, and it was higher in those years when dzud and drought both occur in one year (Begzsuren et al., 2004). It has been recognized that dzud disaster is directly induced by the harsh winter conditions but often influenced by drought in the previous summer (Kang et al., 2015). Dzud occurs every 5 to10 years in Mongolian plateau (Templer et al., 1993). Black dzud occurs mainly in the Gobi Desert once after every two years (Natsagdorj and Dulamsuren, 2001). Drought leads to overgrazing which in turn results in pastures degradation, for example during 1991-92, droughts resulted an excessive cattle mortality in Zimbabwe (SARDC, IUCN and SADC, 1994). Begzsuren et al. (2004) concluded that dzud followed by drought resulted in the highest rates of livestock mortality in 1962 and 1983, in Mongolia. An extreme cold exposure event occurred between March 14th and 19th during 2011 in northern and central Lao People’s Democratic Republic resulting in a major mortality of cattle and buffalos which results in 246.4 million USD economic losses (Khounsy et al., 2012). During 2000–2002 and 2009–2010 round about 20 million of livestock mortality occurs because of harsh environmental conditions such as cold winter and drought in summer (Rao et al., 2015). Wang et al. (2013) showed that 12 million livestock mortalities occurred during 2001-02 because of dzud. Dzud in 2000 resulted in over 70% of the territory of Mongolia and 9% of the total livestock mortality (Batjargal, 2001). During the 2014–2015 dzud, 90% of the country was covered in snow and temperatures dropped to –50 °C, summer drought leads to 40% reduction in wheat production and pastures (NSO, 2015). Dzud, drought and diseases are some of the factors currently causing significant livestock losses. Impact of climate change on livestock production is a vital concern in the world particularly in developing countries where many rural households depend on livestock production for their livelihoods (Musemwa et al., 2012). Over the past 70 years, 2.1 0C average increased in annual temperature was recorded in Mongolian plateau (Dagvedorj et al., 2009). In recent years climatic change affects Mongolian plateau, thus it has been suggested that for sustainable development adaptation to climatic change is crucial (Wang et al., 2013). Climate change is expected to increase severe dzud (Bayasgalan et al., 2009; Fernandez et al., 2012). Overgrazing results in pastures degradation which affect livelihood of small herder household income. Changing environmental conditions, water resources, pastures quality, reduced mobility and over grazing results in pastures degradation (Sternberg, 2008). Total livestock numbers rise considerably after decollectivization of the livestock sector in 1992 (Lkhagvadorj et al., 2013). About 75% of the total area has been affected by the unrestrained grazing of animals, including cattle (cows, yaks, and cow-yak hybrids), camels, goats, horses and sheep following a nomadic pattern for thousands of years, as nomadism appears to be a hazardous enterprise (Goldstein et al., 1990). In order to investigate the effect of extreme weather conditions and diseases on livestock mortality, herder livelihood and their income, current study was carried out in Khentii and South Gobi provinces, Mongolia. In South Gobi province data was collected from Bayandalai, Khurmen and Khankhongor districts while in Khentii province data was collected from Kherlen, Delgerkhaan and Bayankhutag districts. We analyze herders population, education and age, total number of livestock population, livestock mortality and its associated economic losses, herder monthly income from livestock husbandry and their expenditures and also herders problems related to natural hazards. The study was carried out in two provinces of Mongolia i.e., South Gobi (43° 34′ 12″ N, 104° 25′ 33″ E) and Khentii (47° 19’ N, 110° 39’ E). South Gobi province is located in the Southern Mongolia is one of Mongolia largest province. South Gobi province consists of 15 soums (districts). South Gobi province is 553 km far away from the capital city, Ulaanbaatar. The total area of South Gobi province is 165,400 km2 with a total population of 61,500. The total population comprised of 19,900 households having 5417 herders’ households. The total number of livestock population during 2016 was 2313963. The climate of South Gobi province is the driest and hottest from all regions of Mongolia. The mean annual precipitation is less than 100 mm year-1 while mean temperature reaches up to 40°C in summer while -30°C in winter. In South Gobi province data was collected from Bayandalai (43° 28′ 01″ N, 103° 30′ 45″ E), Khankhogor (43° 46′ 57″ N, 104° 28′ 52″ E) and Khurmen (43° 18′ 20″ N, 104° 04′ 31″ E) districts. Bayandalai district (10,751 km2; 2,098 residents) is located in the south and 84 km away from the center of province Dalanzadgad city. Khankhogor district (9,931 km2; 1,992 residents) is 25 km while Khurmen district (12,393 km2; 1,590 residents) is 61 km away from the center of province Dalanzadgad city. Khentii province is located to the north east part of Mongolia, 331 km away from the capital city Ulaanbaatar. Khentii province consists of 18 soums (districts). Khentii province has an area of 80.300 km2 with a total population of 72,300. This population comprised of 21,900 households. Total number of herders’ household was 6356 while total number of herders was 11795. During 2016 the total number of livestock population was 3903570. The mean annual precipitation is 320 mm year-1 while mean temperature reaches up to 30-35 °C in summer while -32 to -37°C in winter. In Khentii province data was collected from Kherlen (47° 19′ 24″ N110° 39′ 40″ E), Delgerkhaan (47° 10′ 41″ N,109° 11′ 22″ E) and Bayankhutag (47° 10′ 17″ N,110° 49′ 03″ E) district. Kherlen district (3,788 km2; 22,279 residents) is the center of the province. 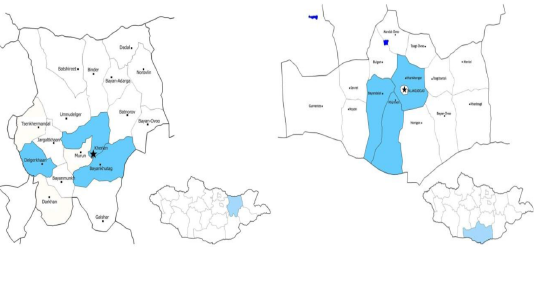 Delgerkhaan district (3,986 km2; 2,396 residents) is 125 km while Bayankhutag district (6,029 km2; 2,244 residents) is 22 km away from the center of province (Figure 1). Figure 1: Location of the study areas, Khentii province (left) and South Gobi province (right), in Mongolia. The survey was carried out during February 2016 and 2017, respectively. We interviewed 56 herder households in South Gobi province while 44 herder households in Khentii province. In South Gobi province data was collected from Bayandalai (26 herder households), Khurmen (14 herder households) and Khanhongor (16 herder households) districts while in Khentii province from Kherlen (14 herder households), Delgerkhaan (11 herder households) and Bayankhutag (19 herder households) districts. We visited their homes, which are locally known as gers (constructed from wooden frame work, walls and felt roofs). These homes were far away from one another so we need help from village leader to find them. Interviews were carried out in Mongolian language and took around about one hour per household and two three days per districts. We collect data on: total number of family members (male and females) of herder households, age and education level of every family member, total number of livestock population of herder households (camels, cattle, horses, sheep and goats), livestock mortality because of diseases (5 types of livestock), livestock mortality because extreme weather conditions (5 types of livestock), economic losses because of livestock mortality, herder household monthly income and expenditure and problems to herder household related to natural hazards. The national Mongolia currency (Mongolian tugrik, MNT) was converted to US dollars (USD) based on the exchange rate of February 25th, 2017 (1MNT=0.0004 USD) in order to find out the effect of livestock mortality on herders economic loss. Herder households monthly income and expenditure, population, age and education structure of 2016-year data was presented in this paper. The meteorological data (Figure 2) of 2015 and 2016 was obtained from meteorological stations of Khentii and South Gobi provinces, respectively. The analysis was carried out by using Excel 2016. Data from each sampling event was analyzed separately and presented as means. 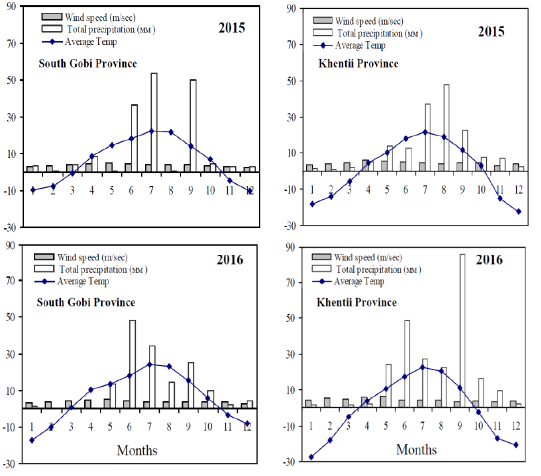 Figure 2: Mean annual temperature (0C), precipitation (mm) and wind speed (m s-1) of South Gobi and Khentii provinces during the years 2015 and 2016. 36-45 years old, 11% (6.1% M & 4.9% F) are in the age of 45-55 years old, 9.8% (3.7% M & 6.1% F) of the population are in the age of 56-65 years and 11% (5.5% M & 5.5% F) of the population age is more than 65 years old (Figure 3). In Khentii and South Gobi province interviewed herder households, 10.7% and 11.7% of the populations have primary school education, 30.5% and 32.5% have school middle school, 36.6% and 35% have high school while 12.2% and 15.3% have bachelor education, respectively. Our study showed that none of master and PhD degree holder was recorded in Khentii and South Gobi provinces (data not shown). Figure 3: Age of the populations in the (a) South Gobi province (N = 56) and (b) Khentii province (N = 44). All interviewed herders households in Khentii and South Gobi Province owned livestock. Total livestock number and mean livestock number per household of South Gobi province is higher than Khentii province during 2015 and 2016 study years. In South Gobi province at the end of 2015, the total number of five kinds of livestock for 56 herders’ household was 27479 livestock, with a mean of 490.7 livestock per herder household while in 2016 the livestock number was increased (7.9%) to 29651 (Table 1). Each herder household owned 529.5 livestock in 2016. Goats (57.9%) followed by sheep (31.8%) number were higher as compared to the rest of the livestock. Mean of the data showed that in 2015 each household owned 15.4 camels, 25.9 horses, 9.3 cattle, 155.8 sheep while 284.3 goats. Average mean of the data showed that 12.7% increased in camels, 7.3% horses, 17% cattle, 8.4% sheep while 7.1% increase in goats number were recorded during 2016. Total livestock population in 2015 in Khentii province, 44 herder households was 19,196 livestock with a mean of 436.3 livestock per herder household while in 2016 the livestock number was increased (14.6%) to 22014 livestock (Table 1). Each household owned 500.3 livestock in 2016. Round about 90% of the total livestock population comprised of sheep (50.8%) and goats (38.6%) during 2016. Average mean of the data showed that during 2015 each household owned 0.8 camels, 27 horses, 17.2 cattle, 231.7 sheep and 159.5 goats. In 2016, 24.3% increased in camels, 17.3% in horses, 17% in cattle, 9.7% in sheep while 21.2% increase in goats number was recorded. Our results showed that during 2016 in South Gobi 56 herder households, 30.4% herder households have 101-300 livestock, 33.9% (301-500 livestock), 10.7% (501-700 livestock), 8.9% (701-1000 livestock) and 8.9% herder families have more than one thousand livestock population (Table 2). During 2016 in Khentii province, 13.6% herder families have less than 50 livestock, 9.1% (51-100 livestock), 27.3% (101-300 livestock), 9.1% (301-500 livestock), 6.1% (501-700 livestock), 15.9% (701-1000 livestock) while 18.2% herder families have more than one thousand livestock population. Table 2: Percentage of households with livestock number in the South Gobi and Khentii province. During 2015 significant livestock mortality occurred in South Gobi and Khentii provinces as compared to 2016 (Table 3). Significant livestock mortality due to diseases was recorded in South Gobi. Total livestock mortality because of diseases in South Gobi province, was 232 livestock with a mean of 4.1 ± 6.4 livestock mortality per herder household during 2015 while in 2016 livestock mortality was 98 livestock, with a mean of 1.8 ± 4.7 livestock per herder household. During 2015, 5 (2.2%) camels, 6 (2.7%) horses, 3 (1.1%) cattle, 108 (46.5%) sheep and 110 (47.5%) goats died because of diseases. Per herder household goats (2) and sheep (1.9) mortality was higher as compared to large livestock. Livestock mortality because of diseases was lower in 2016 as compared to 2015. Total livestock mortality in 2015 in Khentii province was 126 livestock with a mean of 3 ± 3.9 livestock mortality per herder household while in 2016 livestock mortality was 106 livestock of 44 herder households, with a mean of 2.4 ± 4.9 livestock per herder household. Goats (63.3% & 63.2%) and sheep (34% & 35.8%) mortality was higher in both study years as compared to the rest of livestock in Khentii province interviewed households. Average mean of the data showed that during 2015 per herder household, 0.1 cattle, and 1 sheep while 1.8 goats were died because of diseases. Mongolian plateau is facing climatic change. Extreme weather conditions are the major climatic hazards of Mongolian livestock production. Extreme cold (-50 oC) exposure in winter followed by drought in summer with deficit rainfall have severe effects on livestock health and fodder production. Significant livestock mortality occurs because of extreme weather conditions in Mongolia. Our study showed that significant livestock mortality occurs in South Gobi and Khentii provinces during 2015-16 (Table 4). Livestock mortality was higher in 2015 as compared to 2016 in South Gobi and Khentii province interviewed herder households. During 2015, in South Gobi province, 577 livestock mortality occurs because of extreme weather conditions of 56 interviewed herder households, with a mean of 10.3 ± 8.0 livestock per herder household while in 2016, 284 livestock mortalities was recorded with a mean of 5.1 ± 9.8 livestock mortality per herder household. Goats (55.4% & 56.3%) followed by sheep (37.7% & 38.7%) mortality were higher in 2015-16 as compared to the large livestock. Per herder household goats (5.7 & 2.9) and sheep (3.9 & 2) mortality was higher as compared to camels, horses and cattle during 2015-16. Total livestock mortality due to extreme weather conditions in 2015 in Khentii province, 44 herder households was 401 livestock with a mean of 9.1 ± 10.5 livestock mortality per herder household while in 2016 livestock mortality was 360 livestock, with a mean of 8.2 ± 10.1 livestock per herder household. Average mean of 2015-16 data showed that goats (65.1% & 65.3%) and sheep (30.9% & 32.8%) mortality was higher as compared to large livestock. During 2015-16, per herder household goats (5.9 & 5.3) and sheep (2.8 & 2.7) mortality occurs because of extreme weather conditions. Livestock mortality of large (camel, horse, cattle) livestock was lower as compared to goats and sheep mortality. During 2015-16, extreme weather conditions and diseases significantly resulted in livestock mortality. Livestock mortality was higher in 2015 as compared to 2016 in Khentii and South Gobi provinces interviewed herder households. Extreme weather conditions significantly affected herder household income in South Gobi province in terms of livestock mortality during 2015 and 2016. Economic losses because of livestock mortality were higher in 2015 as compared to 2016. Our results showed that a total of 31685 (USD) economic losses were recorded of 56 herder households, with a mean of 565.8 (USD) per herder household during 2015 while 13022 (USD) economic loss occur because of livestock mortality during 2016 with a mean of 232.5 (USD) per herder households (Table 5). Economic losses because of sheep (33.4% & 36.4%) and goats (25.1% & 32.7%) were higher as compared to the rest of livestock. Our results showed that per herder household sheep (189.2 & 84.6 USD) and goats (142 & 76.1 USD) result in higher economic loss as compared to large livestock during 2015-16 study years. Total of 17376 (USD) economic loss was recorded of 44 herder households of Khentii province with a mean of 395 (USD) per herder household in 2015 while 13052 (USD) in 2016 with a mean of 296.6 (USD) per interviewed herder households (Table 5). Goats (38 % & 45.5%) and sheep (33.9% & 42.1%) resulted in higher economic loss as compared to the rest of livestock during 2015-16. Per household economic losses because of goats (150.1 & 134.9 USD) and sheep (133.9 & 125 USD) mortality was also higher as compared to large livestock during 2015-16. Table 3: Livestock mortality because of diseases during the years 2015 and 2016 in the South Gobi (N = 56) and Khentii province (N = 44). 2015 and 2016 in the South Gobi (N = 56) and Khentii province (N = 44). During 2016, in Khentii province the total income per month of 44 interviewed herder households from livestock husbandry was 10472 USD, with a mean of 238 USD per herder household per month (Figure 4). The total expenditures of 44 herder households per month was 10948 USD, with a mean of 248.8 USD per herder household per month. Per household expenditures was 4.5% higher as compared to their income. In South Gobi province during 2016 the total income of 56 interviewed household per month from livestock was 13684 USD, with a mean of 244.4 USD per household per month. The total expenditures of 56 herder households was 12908 USD, with a mean of 230.5 per household per month (Figure 4). In South Gobi province expenditures per herder household was 5.8% lower than their income from livestock. Most herders produce livestock only for as a source food. Our survey showed that herders income is only from their livestock which they raise and spend their life in Khentii and South Gobi provinces. Table 5: Economic losses (USD) because of livestock mortality due to diseases, hypothermia and droughts during the years 2015 and 2016 in the South Gobi (N = 56) and Khentii province (N = 44). 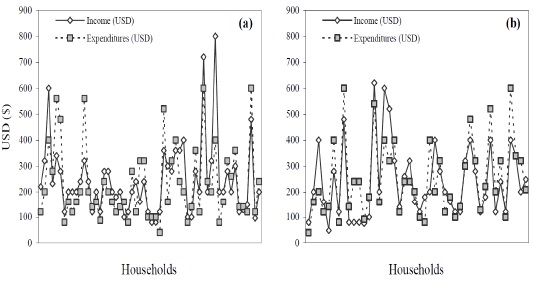 Figure 4: Mean monthly income (USD) from livestock husbandry and expenditures (USD) of (a) South Gobi province (N = 56) and (b) Khentii province (N =44). Our study showed that herders face a lot of problems especially related to environmental hazards. Dzud, drought, diseases, pastures degradation, forage unavailability and cold winter are some of the crucial problems which affect significantly livestock production in Mongolian plateau. 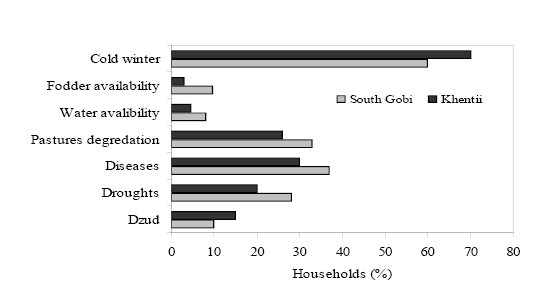 Extreme cold winter (South Gobi 60%, Khentii 70%), dzud (South Gobi 10%, Khentii 15%), drought (South Gobi 28%, Khentii 20%) and diseases (South Gobi 37%, Khentii 30%) are the main causes of livestock mortality in Mongolia (Figure 5). Most herders in South Gobi province say that dzud followed by drought results in significant livestock mortality. Forage production become extent in years during dzud followed by drought. Fodder availability (South Gobi 9.5%, Khentii 3%) is one of the problems of herder households in study area. Our study showed that pastures degradation (South Gobi 33%, Khentii 26%) is also the main problem of herder household livestock production. Water availability (South Gobi 8%, Khentii 4.5%) is also a problem indicated by some interviewed households. Livestock husbandry plays an important role in Khentii and South Gobi provinces as measured by the large families that raise livestock, the main source of their income. 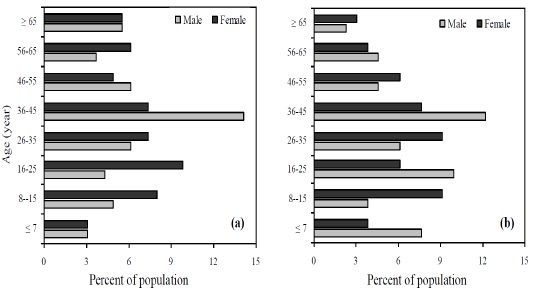 Half of the Mongolian population depends on livestock husbandry (Johnson et al., 2006), especially in rural areas where herders’ income mainly depends on livestock husbandry (Mahul and Skees, 2007). In rural areas livestock husbandry plays an important role in herders household economy (Dovie et al., 2006; Simela et al., 2006). During 2015, 55 million livestock population was recorded in which sheep (24,933,400) and goats (23,582,200) population was higher as compared to large livestock (NSO, 2015). Our data showed that goats and sheep population was higher as compared to large livestock in Khentii and South Gobi herder households. The trends of livestock population in our studied herder households indicated that in the Khentii and South Gobi provinces was a trend for great increase in goats and sheep population and moderate increase in large livestock population. This data showed that the trend towards goats for cashmere production and sheep for meat production (Lecraw et al., 2005). Lkhagvadorj et al. (2005) concluded that goats population was significantly increased while moderate decrease in large livestock population were recorded in Shireegiin gol, Tsagaankhairkhan soum, Mongolia. Mongolian plateau is facing climatic change; during 1961-2009 with mean average temperature increase of 2.1 0C and mean annual precipitation decreased by 7% (Dagvedorj et al., 2009). 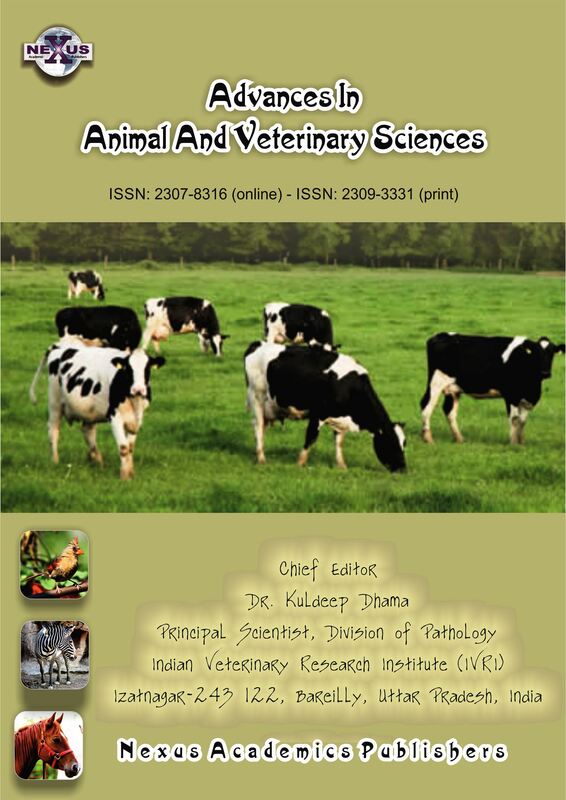 Climatic changes have significant bad effects on livestock husbandry (Musemwa et al., 2012). Climate change is estimated to increase severe dzuds in Mongolia (Bayasgalan et al., 2009; Fernandez-Gimenez et al., 2012). Dzud and droughts are the main climatic hazards which effect Mongolian plateau (Martin, 2010). 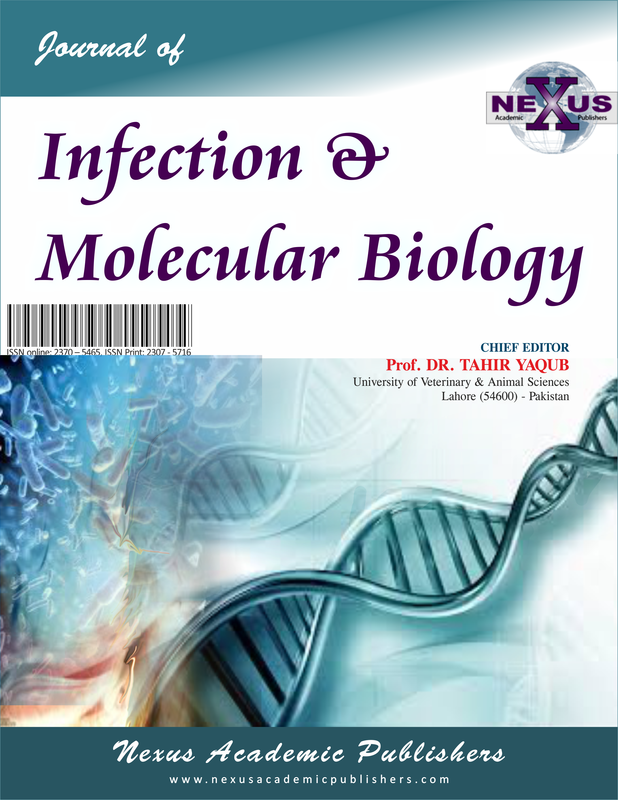 Shabb et al. 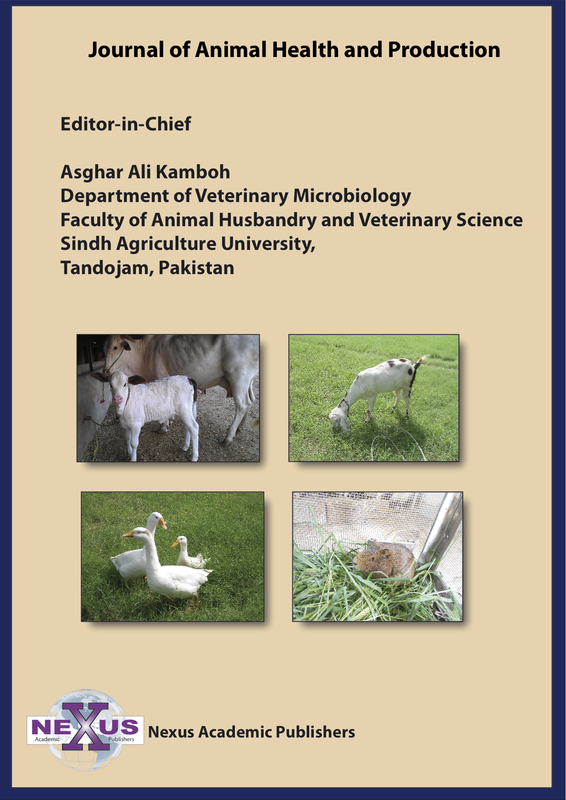 (2013) concluded that dzuds, droughts, diseases, pastures degradation are some of the main constraints which significantly affect livestock husbandry. Dzuds and droughts leads to excessive livestock mortality (Middleton and Sternberg, 2013; Sternberg, 2010; Tachiiri et al., 2008; Chogsom, 1964; Natsagdorj and Dulamsuren, 2001). Dzuds in 2001-2002 results in 12 Million and 2009-2010 exhibit 8.5 Million livestock mortality in Mongolia (Middleton et al., 2015; Vernooy., 2011). During 2000 dzud, 9% of total livestock population mortality occurs in Mongolia (Batjargal, 2001). Droughts stress occurs because of deficit rainfall for prolong periods (Elliot et al., 1991). Dzuds followed by droughts results in significant livestock mortality (Begzsuren et al., 2004). Droughts lead to pastures degradation. Our results showed that extreme weather conditions and diseases resulted in significant livestock mortality. The effects of extreme weather conditions on livestock mortality were higher as compared to diseases. Extreme weather conditions and diseases significantly resulted in goats and sheep mortality as compared to large livestock. Livestock mortality was higher in 2015 as compared to 2016. During 2015, temperature drop to -50 0C, severe snowfall and extreme cold weather in winter followed by droughts in summer significantly resulted in livestock mortality as compared to 2016. Livestock Mortality significantly resulted in herder economic loss. Our results showed that herders economic losses in 2015 were higher as compared to 2016 because of higher livestock mortality during 2015. In South Gobi province during 2015, economic losses were higher as compared to Khentii provinces. Economic losses because of goats and sheep mortality were higher as compared to large livestock in South Gobi and Khentii provinces. Khounsy et al. (2012) concluded that extreme cold exposure in northern and central Lao People’s Democratic Republic results in livestock mortality and 246.4 million USD economic losses was estimated because of livestock mortality. Our results showed that extreme weather conditions, diseases, pastures degradation, forage unavailability and cold winter are the main problems of herder households in Khentii and South Gobi province. These natural hazards have significant effect on livestock and forage production. Drought and excessive grazing leads to pastures degradation. Drought results in water scarcity for human and livestock. Sternberg (2008) showed that change in environmental conditions and over grazing results in pastures degradation. The preventive measures before dzud includes, making of more hay, repairing and cleaning of winter shelter, selling of livestock and prevention of animal pregnancies (Middleton et al., 2015). Proper government support to herder households could results in reduced economic losses because of livestock mortality in Mongolian plateau due to extreme weather conditions and diseases. Livestock husbandry is the main income source of herder households in Mongolia. Herders raise livestock and sell their products in order to meet their daily requirements. Livestock population especially goats and sheep was higher in South Gobi and Khentii provinces than large ruminants. Natural hazards significantly affect livestock production in Mongolia. Every year significant livestock mortality occurs because of natural hazards. 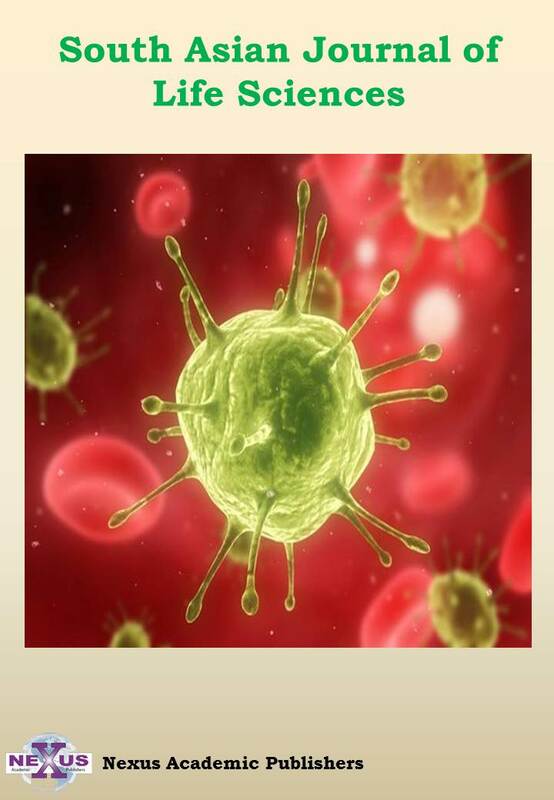 Livestock mortality because of extreme weather conditions is higher as compared to diseases. Livestock mortality in 2015 was higher as compared to 2016 because of extreme cold winter in winter (-50 0C). Livestock mortality of small livestock such as goats and sheep were higher as compared to large livestock during 2015-16. High livestock mortality results in higher economic losses of herder households during 2015. Economic losses were lower in 2016 as compared to 2015. Our results showed that extreme weather conditions, diseases, pastures degradation, fodder production and water availability during drought are the main problems in South Gobi and Khentii provinces. Proper government support and policies are needed to help poor herders in South Gobi and Khentii provinces, in order to reduce livestock mortality and enhance pastures improvement. The author is very grateful for the support of grant No. 14BJY121 from the National Social Science Foundation of China. We are also grateful to Sodnompil Tserennadmid and Gantumur Orgil during data collection in Mongolia. The Bayasgalan Bilegjargal, Qian Lu conceived and make the draft and other coauthors help in writeup and analysis of the data. •	Batjargal Z (2001). Lessons learnt from consecutive dzud disaster of 1999–2000 in Mongolia in Asia.” Proc. Abstracts of open symposium on change and sustainability of pastoral land use systems in temperate and Central Asia. Ulaanbaatar, Mongolia. Pp 75. •	Bayasgalan B, Mijiddorj R, Gomboluudev P, Oyunbaatar D, Bayasgalan M, Tas A, Narantuya T, Molomjamts L (2006). Climate change and sustainable livelihood of rural people in Mongolia. In T.Devissher, G. O’Brien, P. O’Keefe, & I. Tellam (Eds), The adaptation continuum: groundwork for the future (Pp. 193-213). Leusden, The Netherlands: ETC Foundation. •	Chogsom D (1964). Some aspects of dzud studies, geographical aspects in Mongolia, Department of Hydrology and Meterology Service of Mongolia, No. 2, Ulaanbaatar. •	Dagvadorj D, Natagdorj L, Dorjpurev J, Namkhainyam B (2009). Mongolia: Assessment report on climate change. Ulaanbaatar: Ministry of Environment, Nature and Tourism. (pp. 228). •	Elliot J, Connors J, Steeby A (1991). Agriculture and science: linkages for the future. The Agricultural Education Magazine. 63(7):6-14. •	Goldstein MC, Beall CM, Cincotto RP (1990). Traditional nomadic pastoralism and ecological conservation on Tibet’s Northern Plateau. National Geographic Res. 6(2): 139-156. •	Johnson DA, Sheehy DP, Miller D, Damiran D (2006). Mongolian rangelands in transition. Science Et Changements Planétaires. 17(1):133-141. •	Kang S, Jang K, Lkhamsuren B (2015). Satellite-based Assessments on Regional Summer and Winter Conditions Triggering Massive Livestock Loss (Dzud) in Mongolia. Proceedings of the Trans-Disciplinary Research Conference: Building Resilience of Mongolian Rangelands. Ulaanbaatar Mongolia, June 9-10. •	Lecraw DJ, Eddleston P, McMahon A (2005). A value Chain Analysis of the Mongolian Cashmere Industry. USAID Economic Policy Reform Competitiveness Project, Ulan Bator. •	Mahul O, Skees, JR (2007). Managing Agricultural Risk at the Country Level: The Case of Index-Based Livestock Insurance in Mongolia. Soc. Sci. Electron. Publish. 1-37: 37. •	Musemwa L, Muchenje V, Mushunje A, Zhou L (2012). The Impact of Climate Change on Livestock Production amongst the Resource-Poor Farmers of Third World Countries: A Review. Asian J. Agric. Rural Develop. 2(4): 621-631. •	National Statistical Office of Mongolia. Mongolians Statistical Yearbook, Ulaanbaatar. National Statistical Office of Mongolia, 2015 and 2016. •	Natsagdorj L, Dulamsuren J (2001). Some aspects of assessment of the dzud phenomena. In: Batjargal, Z. (Ed. 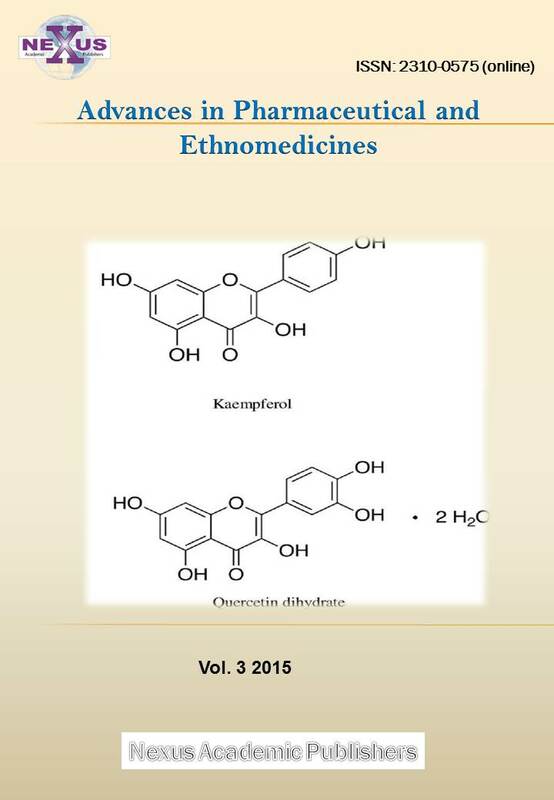 ), Papers in Meterology and Hydrology, Vol. 23(3). Institute of Meterology and Hydrology Press, Mongolia. Pp. 3–18. •	SARDC, IUCN, SADC (1994). “State of the Environment in Southern Africa”, SARDC, IUCN and SADC, Harare, Zimbabwe, and Maseru, Lesotho. •	Shagdar E (2002). The Mongolian Livestock Sector. Vital for the Economy and People, but Vulnerable to Natural Phenomena. Economic research institute for northeast Asia, Japan. (47) 4-26. •	Simela L, Montshwe BD, Mahanjana AM, Tshuwa MP (2006). The livestock production, environment in the South African small holder sector. 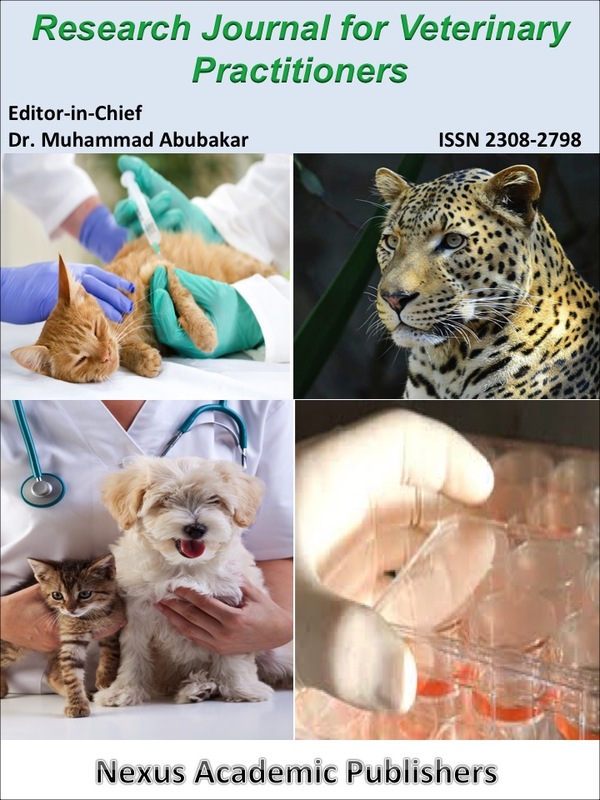 New challenges for the animal science industries. SASAS 41st Congress Abstracts. Pp. 66.